From the Greek mikros (small), and soros, indicating the small sori of some species, notably the type. Epiphytic, rupestral or terrestrial ferns. Rhizomes long-creeping (NZ) or short-creeping (not NZ), scaly. Rhizome scales clathrate, squarrose or appressed. Fronds monomorphic or dimorphic, articulated to short stalks (phyllopodia) at intervals along the rhizome. Laminae undivided, variously lobed or deeply 1-pinnatifid, herbaceous to coriaceous, virtually glabrous. Veins reticulate, usually forming 1–3 series of areoles between costa and lobe margin; areoles with free included veinlets, ending in hydathodes. Sori round or slightly elongate, superficial or impressed into the lamina and bulging on upper surface, arranged in one row either side of costa (NZ) or in more than one row or scattered over the lamina surface (not NZ), not confluent with age, occurring throughout the lamina; paraphyses absent (NZ) or sometimes present as simple uniseriate hairs (not NZ); exindusiate. Spores monolete, bilaterally symmetrical, granulate to tuberculate. A genus of about 50 species when interpreted broadly (Nooteboom 1997). Generic boundaries in this group of ferns remain unclear, and the taxonomy has been complicated by nomenclatural errors. Two principal generic names have been applied to the group – Microsorum Link and Phymatosorus Pic.Serm. The former is often incorrectly spelled Microsorium but that is an orthographic variant of the original name and should not be used (Bosman 1986). The latter is a replacement name for the earlier Phymatodes C.Presl which is illegitimate (Pichi Sermolli 1973). Copeland (1947) reluctantly included both groups within Microsorum even though he felt the types of these genera were “too unlike to be included in any natural genus”. Nevertheless he was unable to find any way to satisfactorily separate them. Bosman (1991) proposed a more restricted circumscription of Microsorum, distinguishing it from the other microsoroid genera, Colysis, Leptochilus, Neocheiropteris and Phymatosorus. In particular, Phymatosorus was distinguished from Microsorum by having more than five pairs of lamina lobes, anadromous rather than catadromous tertiary veins, a different arrangement of the sori on the veins, and sori sometimes sunk in the lamina. Following Bosman’s revision, the name Phymatosorus was quite widely adopted for the three species present in New Zealand. However, some of the diagnostic characters of Phymatosorus have been questioned in a later treatment of the microsoroid ferns by Nooteboom (1997) who reverted to a broader interpretation of Microsorum. Molecular evidence suggests that Microsorum is polyphyletic (Schneider et al. 2004). Moreover, M. punctatum and M. scolopendria, the types of Microsorum and Phymatosorus respectively, occur in the same core microsoroid clade, whereas the three New Zealand taxa belong in a separate clade, along with species of Lecanopteris. Whilst the former group might be treated as Microsorum sens. str., the latter group has no satisfactory name available at present (Schneider et al. 2006). Hence, a broad interpretation of Microsorum is adopted here until such time as a clearer phylogeny of the group can be determined, and robust generic boundaries identified. This is consistent with the approach taken in Australia where two of the New Zealand species also occur (Bostock & Spokes 1998). Mostly tropical but a few species extending into south temperate regions; six in Africa, eight in Australia, ca. 20 in the Pacific, and the majority in Asia from India and China to Malesia. One species endemic and two indigenous in New Zealand. n = 36, 37 (Hennipman et al. 1990). Bosman, M.T.M. 1986: Original Microsorum vs. later Microsorium (Polypodiaceae). Taxon 35: 590–591. Bosman, M.T.M. 1991: A monograph of the fern genus Microsorum (Polypodiaceae). Leiden Botanical Series 14: 1–161. Bostock, P.D. ; Spokes, T.M. 1998: Polypodiaceae. In: Flora of Australia. Vol. 48. 468–495. Brownsey, P.J. ; Perrie, L.R. 2015: Polypodiaceae (excluding Notogrammitis). In: Breitwieser, I; Heenan, P.B. ; Wilton, A.D. Flora of New Zealand — Ferns and Lycophytes. Fascicle 1. Manaaki Whenua Press, Lincoln. Copeland, E.B. 1947: Genera Filicum. Chronica Botanica Co., Waltham, Mass., U.S.A.
Crookes, M.W. 1963: New Zealand Ferns, ed. 6. Incorporating illustrations and original work by H.B. Dobbie. Whitcombe & Tombs, Christchurch. Hennipman, E.; Veldhoen, P.; Kramer, K.U. 1990: Polypodiaceae. In: Kramer, K.U. ; Green, P.S. Pteridophytes and gymnosperms. Vol. 1. In: Kubitzki, K. (ed.) The Families and Genera of Vascular Plants. Springer-Verlag, Berlin. Link, J.H.F. 1833: Hortus Regius Botanicus Berolinensis. Vol. 2. Reimer, Berlin. Nooteboom, H.P. 1997: The microsoroid ferns (Polypodiaceae). Blumea 42: 261–395. Pichi Sermolli, R.E.G. 1973: Fragmenta Pteridologiae IV. Webbia 28: 445–477. Schneider, H.; Kreier, H.-P., Perrie, L.R. ; Brownsey, P.J. 2006: The relationships of Microsorum (Polypodiaceae) species occurring in New Zealand. New Zealand Journal of Botany 44: 121–127. Schneider, H.; Smith, A.R. ; Cranfill, R.; Hildebrand, T.E. ; Haufler, C.H. ; Ranker, T.A. 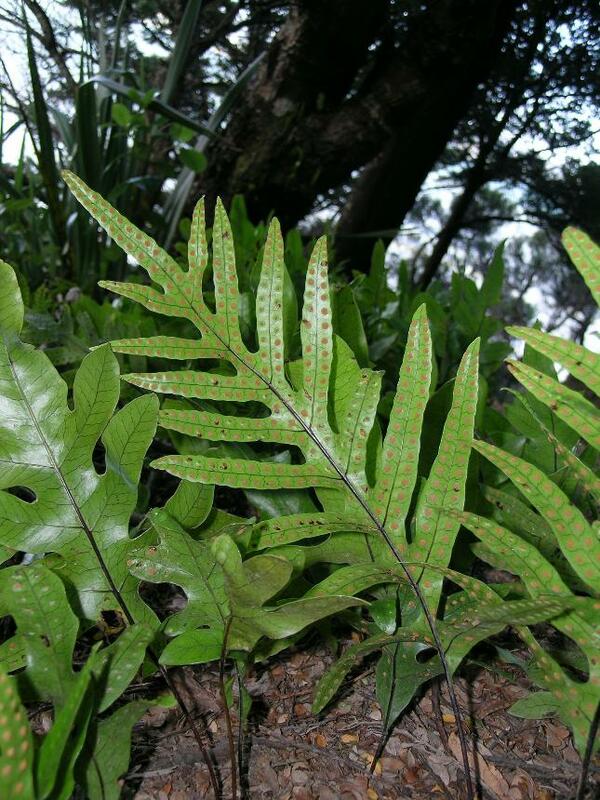 2004: Unraveling the phylogeny of polygrammoid ferns (Polypodiaceae and Grammitidaceae): exploring aspects of the diversification of epiphytic plants. Molecular Phylogenetics and Evolution 31: 1041–1063.